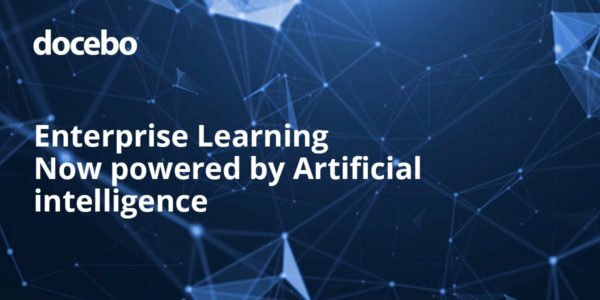 Founded on a culture of innovation and strength in leadership, Docebo is proud to share their vision and release the foundation that will transform the future of enterprise learning with artificial intelligence. TORONTO, ON. - October 11, 2018 - Docebo 7.5 unveils the first iteration of the learning platform’s evolution into an artificial intelligence (AI) platform for learning. The newest release lays the foundation for a seismic shift in enterprise learning, both internally and across the extended enterprise. Docebo’s learning-specific artificial intelligence algorithms are powered by a combination of machine learning, deep learning, and natural language processing. After years of market research, experimentation and technological development, Docebo’s vision to bring to market an artificial intelligence platform for enterprise learning comes to life today, designed to deliver automated and personalized learning – at scale. Docebo’s AI deeply analyzes learning content of any nature, understanding and categorizing keywords to exponentially improve learning content discoverability. AI analyzes all learning content, identifying keywords and creating tags automatically, making it easier to uncover content that is relevant to learner interests and their professional development. Invite-to-Watch elevates the social learning experience by automatically generating a list of learners who have engaged with similar content, allowing users to easily share content with those who will value it most. With Docebo 7.5, users will also have access to the all-new My Team feature. My Team gives managers instant visibility of their team members’ learning activities and skill gaps at a glance. Docebo is changing the way people learn with artificial intelligence. While traditional enterprise learning technologies have dictated the way people learn with formal courses pushed from the top down, Docebo’s AI Learning Platform facilitates personalized and automated learning experiences in the flow of work to drive growth, organizational performance and revenue. Docebo is designed to power a cohesive L&D strategy, and has been embraced by more than 1,400 companies around the world for its ability to satisfy multiple use cases for both internal and external enterprise learning. “With Docebo 7.5, we embark on a journey to revolutionize the way people learn with Artificial Intelligence.” Claudio Erba, CEO and leader of innovation at Docebo.